If you're American and between the ages of 12 and 17, there's an 80% chance you own - or have home access to - a videogame console, according to a recent survey. Sure, we've known that millions and millions of Americans play games with at least some regularity for quite some time now, but the widespread extent to which gaming has become so mainstream is still kind of staggering, when you think about it. A new Pew Research Center survey finds that 80 percent of American youth between the ages of 12 and 17 own a videogame console, or otherwise have access to one in their home. Unsurprisingly, boys are more likely to have a console than girls, with a whopping 89% of male respondents saying they had one o' them newfangled videogame things, but girls weren't far behind with a 70% rate of their own. More than half of that 80% also owns a handheld device, according to Pew's numbers. 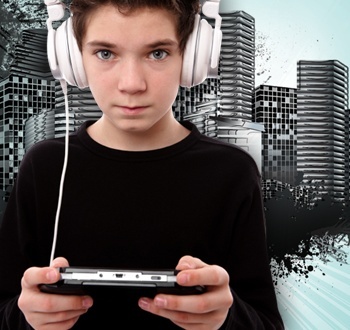 The DS and PSP were predominantly popular with younger gamers - 66% of children aged 12 and 13 have a handheld, compared to 44% of those between 14 to 17. When broken down along gender lines, handheld ownership was 56% boys, 47% girls. So the odds are, if you're a parent and you don't game, you probably don't understand your teenagers. Not that parents needed more evidence to know that, anyway.